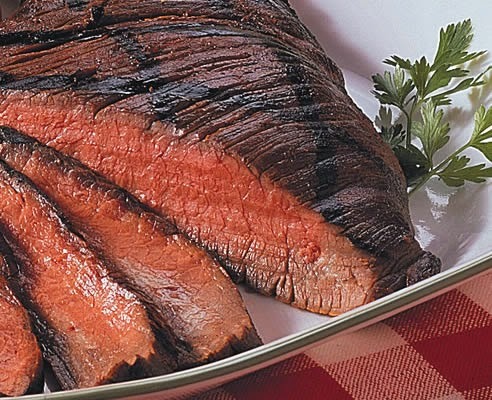 I love flank steak. Love it. It’s perhaps my favorite cut of meat. Think about it. You walk into a grocery store with a $20. You grab a beautiful two-pound wad of cow from which you can serve generous portions of tender, juicy, yummy steak to your nearest and dearest and…you still have money left over to buy the makings for sides. Glorious. · Get yourself a flank steak. Go on. I’ll wait. · Now, coat each side of the steak in kosher salt. Probably 1-2 T. per side. Trust me on this. If you like, you can also sprinkle on some garlic powder, herbs, what have you – but the salt is the key. · Rinse the salt and such off that lovely piece of beef. Pat it dry, then oil it lovingly. · Toss it on the HOT grill (or under the broiler, sigh). Leave it alone. Five minutes is all I ask. Then flip. Five more. Remove from the grill, tent it with foil, and just let it sit there – difficult as that will be to do – for ten minutes, maybe 15 if you can stand it. · Slice into juicy nirvana. Given enough time, the salty solution is then drawn back into the steak as it mingles with the non-salty water in the meat. If you’ve mixed herbs or spices with your salt, those flavors go right along. Additionally, the salt causes the fibers in the meat to relax, tenderizing it beautifully. “But what about bacteria?” you might ask? Saline solutions prevent bacterial growth, so you’ve got no worries there. Trust me, give it a try and you’ll never look at a steak the same way again. A holiday we can all get behind. Why do I bring this up? 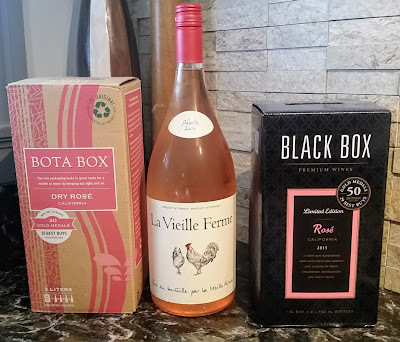 Well, the wine fairy (with help from Jennifer at Colangelo) recently gifted me a pair of South African wines from the well-known Mulderbosch Winery. In summertime (or anytime really) South Africans do their traditional version of grilling called braai. 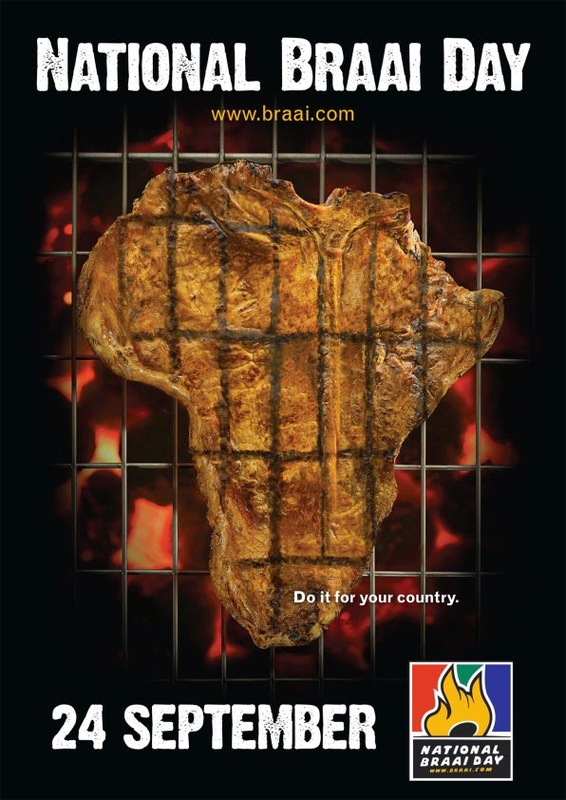 South Africa even has a “National Braai Day,” of which Archbishop Desmond Tutu is a patron, celebrated next month on September 24 – which is also Heritage Day in the Rainbow Nation. 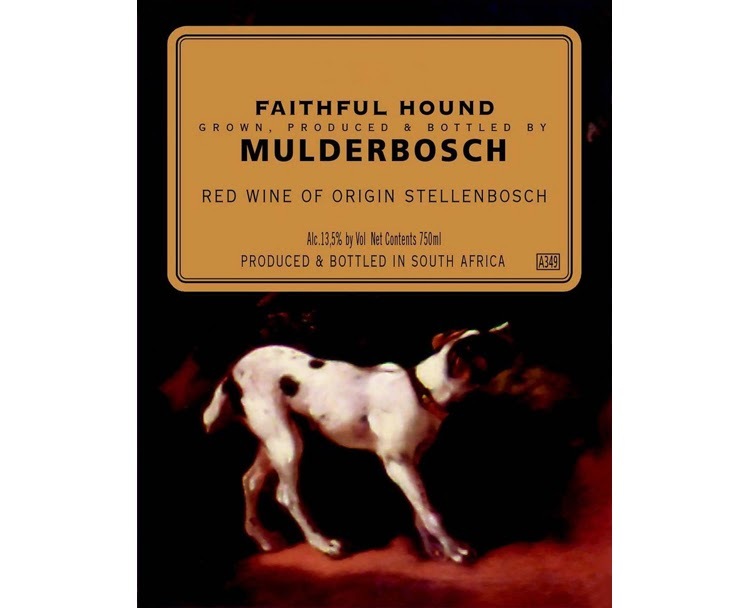 Since I had these wines, I thought I’d do a little braii-ing of my own with this flank steak preparation and the red – the Mulderbosch 2012 “Faithful Hound” Red Blend. The Hound, bottle adorned with a lovable looking redbone coonhound, is a traditional Bordeaux blend – about 60% Cabernet Sauvignon and Cabernet Franc, with the rest made up of Merlot, Malbec, and Petit Verdot. I expected a big, highly tannic red – but was pleasantly surprised to find a more restrained, balanced flavor. Many South African reds can be on the rough side, but this was balanced enough to drink on its own. Good berry and fruit flavors and a really interesting vanilla bouquet. Grippy tannins at the end, but nothing too bitter. I liked it. With the steak (which was monstrously good, by the way), it was as lovely an accompaniment as I could ask for on a weekday evening. It retails for around $19, and I’d say that’s priced just about right. “Steen op Hout” translates from Afrikaans as “Stone on Wood,” which is a decent descriptor for this particular white. Word to the wise, this is a wine that needs a little time for its natural funk to blow off before. My recommendation would be to crack it and allow at least 10 minutes before you dive in. Once you do, you’ll run into a firm floral nose with a strong lemony tone. The flavor, as promised, has a really nice mineral character alongside a solid backbone of grapefruit. The finish is very flinty with a little bit of a bitter, lemon rind-y aftertaste and just a hint of oak. In the year that’s passed, this wine has developed some unexpected depth. There are more tropical fruit flavors like mango and pear bouncing around in this wine. Where I would have really recommended it with shellfish before, now, I’d probably lean more towards light meats with fruit salsas and sauces. To go back to my little salting technique, it works just as well on chicken or pork as well, so you can safely experiment along those lines. The Steen op Hout – retailing for $14 -- is apparently in its 2013 release, since they sent me the tasting notes for that vintage instead of the 2011. That said, this particular wine, as constructed, safely lasted for those a couple of years. I would guess you might see some of the 2011 vintage on your local wine store’s clearance rack to make room for the new bottles. So, if you see some of the 2011 on closeout, snap it up. And now, if you’ll excuse me, I’ve got a date with some scrumptious wraps made from leftover flank steak. Yum.